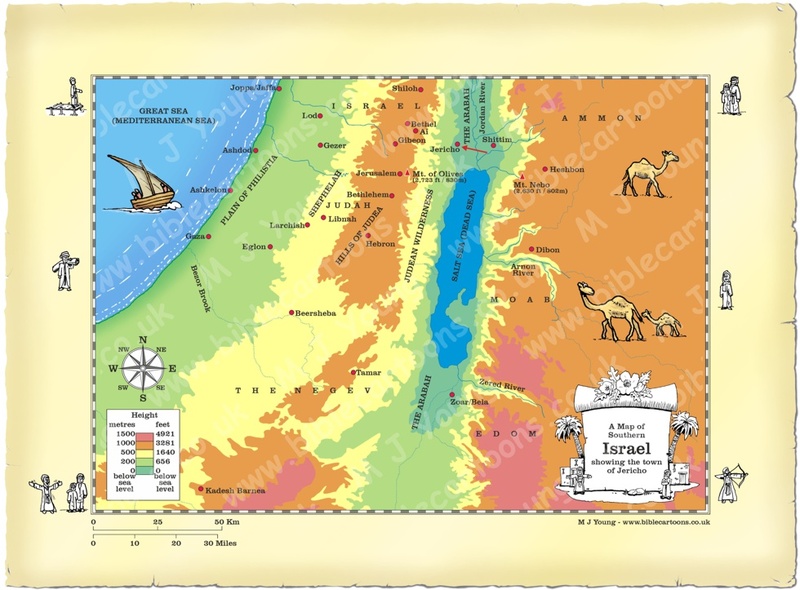 This is my map of Southern Israel showing the city of Jericho. Jericho is one of the earliest continuous settlements in the world, dating perhaps from about 9000 B.C. Archaeological excavations have demonstrated Jericho’s lengthy history. The city’s site is of great archaeological importance; it provides evidence of the first development of permanent settlements and thus of the first steps toward civilization. 1 Then the people of Israel traveled to the plains of Moab and camped east of the Jordan River, across from Jericho. 49 “Go to Moab, to the mountains east of the river, and climb Mount Nebo, which is across from Jericho. Look out across the land of Canaan, the land I am giving to the people of Israel as their own possession. 1 Then Joshua secretly sent out two spies from the Israelite camp at Acacia. He instructed them, “Spy out the land on the other side of the Jordan River, especially around Jericho.” So the two men set out and came to the house of a prostitute named Rahab and stayed there that night. 24 Then the Israelites burned the city and everything in it. Only the things made from silver, gold, bronze, or iron were kept for the treasury of the LORD’s house. 25 So Joshua spared Rahab the prostitute and her relatives who were with her in the house, because she had hidden the spies Joshua sent to Jericho. And she lives among the Israelites to this day. 34 It was during his reign that Hiel, a man from Bethel, rebuilt Jericho. When he laid the foundations, his oldest son, Abiram, died. And when he finally completed it by setting up the gates, his youngest son, Segub, died. This all happened according to the message from the LORD concerning Jericho spoken by Joshua son of Nun. 4 Then Elijah said to Elisha, “Stay here, for the LORD has told me to go to Jericho.” But Elisha replied again, “As surely as the LORD lives and you yourself live, I will never leave you.” So they went on together to Jericho. 29 As Jesus and the disciples left the city of Jericho, a huge crowd followed behind. 46 And so they reached Jericho. Later, as Jesus and his disciples left town, a great crowd was following. A blind beggar named Bartimaeus (son of Timaeus) was sitting beside the road as Jesus was going by. 35 As they approached Jericho, a blind beggar was sitting beside the road.